One in 10 Americans has a hearing loss that affects his ability to understand normal speech. Excessive noise exposure is the most common cause of hearing loss. Yes-noise can be dangerous. If it is loud enough and lasts long enough, it can damage your hearing. The damage caused by noise, called sensorineural hearing loss or nerve loss, can be caused by several factors other than noise, but noise-induced hearing loss is different in one important way-it can be reduced or prevented altogether. No. lf you think you have grown used to a loud noise, it probably has damaged your ears, and there is no treatment-no medicine, no surgery, not even a hearing aid-that truly corrects your hearing once it is damaged by noise. Any source of sound sends vibrations or sound waves into the air. These funnel through the ear opening, down the ear canal, and strike your eardrum, causing it to vibrate, The vibrations are passed to the small bones of the middle ear, which transmit them to the hearing nerve in the inner ear. Here, the vibrations become nerve impulses and go directly to the brain, which interprets the impulses as sound: music, a slamming door, a voice, etc. People differ in their sensitivity to noise. As a general rule, noise may damage your hearing if you have to shout over background noise to make yourself heard, the noise hurts your ears; it makes your ears ring, or you are slightly deaf for several hours after exposure to the noise. Sound can be measured scientifically in two ways. Intensity, or loudness of sound, is measured in decibels. The pitch is measured in frequency of sound vibrations per second. A low pitch such as a deep voice or a tuba makes fewer vibrations per second than a high voice or violin. What Does Frequency Have to Do with Hearing Loss? Young children, who generally have the best hearing, can often distinguish sounds from about 20 Hz, such as the lowest note on a large pipe organ, to 20,000Hz, such as the high shrill of a dog whistle that many people are unable to hear. Human speech, which ranges from 300 to 4,000 Hz, sounds louder to most people than noises at very high or very low frequencies. 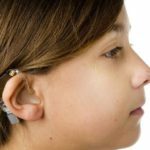 When hearing impairment begins, the high frequencies are often lost first, which is why people with hearing loss often have difficulty hearing the high pitched voices of women and children. Loss of high frequency hearing also can distort sound, so that speech is difficult to understand even though it can be heard. Hearing impaired people often have difficulty detecting differences between certain words that sound alike, especially words that contain S, F, SH, CH, H, or soft C sounds, because the sound of these consonants is in a much higher frequency range than vowels and other consonants. The intensity of sound is measured in decibels (dB). The scale runs from the faintest sound the human ear can detect, which is labeled 0dB, to over 180dB, the noise at a rocket pad during launch. Decibels are measured logarithmically. This means that as decibel intensity increases by units of 10, each increase is ten times the lower figure. Thus, 20 decibels is ten times the intensity of 10 decibels, and 30 decibels is 100 times as intense as 10 decibels. Every gunshot produces a noise that could damage the ears of anyone in close hearing range. Large bore guns and artillery are the worst because they are the loudest. But even cap guns and firecrackers can damage your hearing if the explosion is close to your ear, Anyone who uses firearms without some form of ear protection risks hearing loss. A ringing in the ears, called. Tinnitus commonly occurs after noise exposure, and it often becomes permanent. Some people react to loud noise with anxiety and irritability, an increase in pulse rate and blood pressure, or an increase in stomach acid. Very loud noise can reduce efficiency in performing difficult tasks by diverting attention from the job. If you must work in an excessively noisy environment, you should wear protectors. You should also wear them when you are using power tools, noisy yard equipment, or firearms. Habitual exposure to noise above 85 dB will cause a gradual hearing loss in a significant number of individuals, and louder noises will accelerate this damage. For unprotected ears, the allowed exposure time decreases by ONE HALF FOR EACH 5dB INCREASE in the average noise level. For instance, exposure is limited to 8 hr at 90 dB, 4 hr at 95 dB, and 2 hr at 100 dB. The highest permissible noise exposure for the UNPROTECTED ear is 115 dB for 15 MINUTES/day. Any noise above 140 dB IS NOT PERMITTED. Ideally, noisy machinery and work places should be engineered to be quieter or the workers time in the noise should be reduced; however, the cost of these actions is often prohibitive. As an alternative, individual hearing protectors are required when noise averages more than 90 dB during an 8-hour day. When noise measurements indicate that hearing protectors are needed, the employer must offer at least one type of earplug and one type of earmuff without cost to employees. If the yearly hearing tests reveal hearing loss of 10dB or more in higher pitches in either ear the worker must be informed and must wear hearing protectors when noise averages more than 85 dB for an 8-hour day. Earplugs are small inserts that fit into the outer ear canal. To be effective they must totally block the ear canal with an airtight seal. They are available in a variety of shapes and sizes to fit individual ear canals and can be custom made. For people who have trouble keeping them in their ears, they can be mounted to a headband. Earmuffs fit over the entire outer ear to form an air seal so the entire circumference of the ear canal is blocked, and they are held in place by an adjustable band. Earmuffs will not seal around eyeglasses or long hair, and the adjustable headband tension must be sufficient to hold earmuffs firmly around the ear. Earplugs must be snugly sealed so the entire circumference of the ear canal is blocked. An improperly fitted, dirty or worn-out plug may not seal and can irritate the ear canal. Properly fitted earplugs or muffs reduce noise 15 to 30 dB. The better earplugs and muffs are approximately equal in sound reduction, although earplugs are better for low-frequency noise and earmuffs for high-frequency noise. Why Can’t l Just Stuff My Ears With Cotton? Studies have shown that one-half of the workers wearing hearing protectors receive one-half or less of the noise reduction potential of their protectorsbecause these devices are not worn continuously while in noise or because they do not fit properly. A hearing protector that gives an average of 30 dB of noise reduction if worn continuously during an 8-hour work day becomes equivalent to only 9dB of protection if taken off for one hour in the noise. This is because decibels are measured on a logarithmic scale, and there is a 10-fold increase in noise energy for each 10 dB increase. Also, noise exposure is cumulative. So the noise at home or play must be counted in the total exposure during any one day. A maximum allowable while on-the-job followed by exposure to a noisy lawnmower or loud music will definitely exceed the safe daily limit. When using hearing protectors, you will hear your voice as louder and deeper. This is a useful sign that the hearing protectors are properly positioned. Can I Hear Other People and Machine Problems If l Wear Hearing Protectors? Just as sunglasses help vision in brilliant light, so do hearing protectors enhance speech understanding in very noisy places. Even in a quiet setting, a normal-hearing person wearing hearing protectors should be able to understand a regular conversation.